Þrátt fyrir mikla óvissu í efnahagsmálum gerir greiningardeild Arion banka að hagvöxtur hér á landi verði einn sá mesti í heimi á næstu árum. Þá er gert ráð fyrir umtalsverðum launahækkunum sem muni leiða til aukinnar verðbólgu. Greiningardeild Arion banka kynnti í dag efnahagshorfur til næstu tveggja ára undir yfirskriftinni „Ólga í lygnum sjó“. Vísar titillinn til þess að þótt efnahagshorfur hér á landi séu almennt góðar, séu margir óvissuþættir fyrir hendi. Helstu óvissuþættir í hagspánni eru launahækkanir, fjárfesting og aflétting hafta. Bankinn gerir ráð fyrir umtalsverðum launahækkunum út spátímann og að launavísitalan muni hækka um 7,1% á þessu ári. Þetta muni, ásamt þróun olíuverðs og hækkun á fasteignamarkaði, leiða til aukinnar verðbólgu næstu ár. Hún verði 1,8% á þessu ári, 3,4% á því næsta og 2,9% árið 2017. Þrátt fyrir þessa óvissu gerir greiningardeildin ráð fyrir auknum hagvexti. Hann var í fyrra 1,9 prósent en deildin gerir ráð fyrir að hann verði 2,8 prósent í ár, 3,3 prósent á næsta ári og verði kominn í 3,5% árið 2017. Bankinn gerir þannig ráð fyrir að hagvöxtur hér á landi verði mun meiri en í helstu viðskiptalöndum Íslands, jafnvel einn sá mesti í heimi. Gangi spá bankans eftir verður hagvöxtur á næsta ári einungis meiri í tveimur löndum sem teljast meðal helstu viðskiptalanda Íslands, Grikklandi og Eistlandi. En hvað drífur hagvöxtinn áfram næstu ár? „Það er fyrst og fremst einkaneyslan og fjárfesting. Það er töluvert mikil fjárfesting í kortunum, sérstaklega í ár. Þannig að það tvennt er að drífa hagvöxtinn áfram,“ segir Regína Bjarnadóttir, forstöðumaður greiningardeildar Arion banka. analytical department expected for the economic growth here in Iceland will be one of the highest in the world for the next few years. It is expected for a pay raise which will lead to higher inflation. Analytical department of Arion Bank has introduced today’s economic outlook for the next two years under heading “Olga is in the calm sea”. The title lead to although economic outlook here in the country is generally good, there are many uncertainty factors. Main uncertainty factors of economics predict are pay raise, investment and lifting of capital controls. The bank expects significant pay raise of predicted time and salary index will grow up to 7,1% in this year. But also the development price of oil and increase on market of real estate, lead to higher inflation for next few years. It will be 1.8% this year, 3.4% next year and 2.9% in 2017. Despite of this uncertainty makes analytical department expected for increase economic growth. Last it was 1,9 present but department expected for it to be 2,8 present in this year, 3,3 present next year, and will be 3,5 % in year 2017. Bank expected for the economic growth here in country will be much more than the main trading countries of Iceland, even one of the best in the world. Thought of bank is it will be economic growth next year and also much more in two other economic countries of Iceland, Greece and Estonia. But what will make economic growth next year ? “First of all private consumption and investment. There is quite high investment in cards, especially in one year. 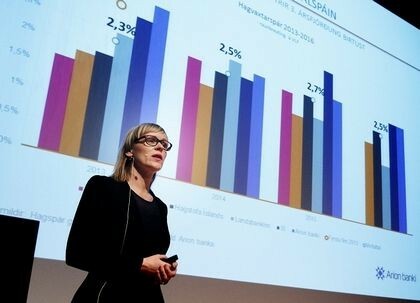 Then there are two things make faster economic growth, ” says Regína Bjarnadóttir, manager of Arion Bank’s analytical department. I chose this text because this is one of the things that I find interesting; I had read many news before I chose this. I find this was one of most interesting news, so I choose this. I often read news about business and economics, what kind of economic growth happened in the world, where in the world is the most inflation and employments. In this text I used all dictionaries that were possible to use, I had use a lot for example Snara.is then just other Icelandic – English online dictionaries. Then I had also asked other people for some words, and also teachers. In translation it’s not easy to translate everything 100% right but I tried my best. The Extended Fund Facility is designed to stabilise Ukraine's economy, restore growth and improve living standards. On top of the IMF funding, the programme also agrees "other bilateral and multilateral funding" to a total value of about $40bn. The World Bank will provide up to $2bn of that package and said it is "vital" that Ukraine pushes through reforms. IMF managing director Christine Lagarde said the deal could prove a "turning point" for Ukraine. But Ukrainian Prime Minister Arseniy Yatseniuk said that the aid package included "very difficult" reforms. Ms Lagarde said it was an ambitious programme and not without risk. Ms Lagarde said that the deal was "a realistic programme and its effective implementation, after consideration and approval by our executive board, can represent a turning point for Ukraine". Mr Yatseniuk said the IMF was demanding reforms to fight corruption, overhaul the energy sector, cut state expenditure and reduce state bureaucracy. 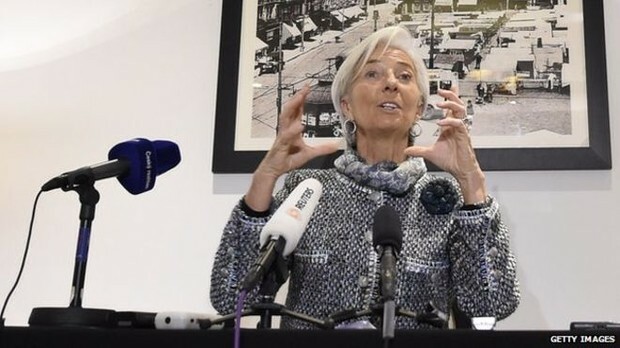 He said he expected a total of $25bn financial support from the IMF as part of a four-year facility, including $17.5bn to stabilise the financial situation in the country. He added that the Ukrainian economy could grow in 2016 if "Russian aggression" was halted and internal reforms were a success. The Extended Fund Facility var stofnað til að koma á stöðugleika hagkerfisins í Úkraínu, endurheimta hagvöxt og bæta lífskjör. Á toppnum af Alþjóðagjaldeyrissjóðs fjármögnum, prógramið samþykkir einnig annað tvíhliða og marghliða fjármögnun að andvirði samtals um $ 40 milljarðar. Banki heimsins vill veita allt að $ 2 milljarða af þessum pakka og sagði að það er mikilvægt að Ukraínu fer fram í gegnum umbætur. Alþjóðagjaldeyrissjóðs framkvæmdastjóri Christine Lagarde sagði að samningur gæti markað þáttaskil fyrir Úkraínu. En Ukraínskur forsætisráðherra Arseniy Yatsenyuk sagði að aðstoðar pakki er með mjög erfiða umbætur. Frú Lagarde sagði að það væri metnaðarfull áætlun og ekki án áhættu. Hún sagði: ,,Þessi nýja áætlun býður mikilvægt tækifæri fyrir Úkraínu til þess að færa hagkerfið sitt áfram á viðkvæmri stund í sögu landsins.’’ Það kom eins og Rússsneskur Vladimir Putin, og Ukraínskur Petro Poroshenko, og leiðtogar Frakklands og Þýskalands tilkynnt að vopnahlé myndi hefja í Austur Úkraínu 15. Febrúar. Frú Lagarde sagði að samningur var að raunhæf program og árangleg framkvæmd, eftir athugun og samþykki framkvæmdastjórn okkar, getur þýtt þáttaskil fyrir Úkraínu. Hr. Yatseniuk sagði að Alþjóðagjaldeyrissjóður var að krefja umbætur til að berjast gegn spillingu, grandskoða orkumál, skera niður útgjöld ríkisins og draga úr skrifræði. Hann sagði að hann byggist við samtals $25 milljarða fjárhagslegum stuðningi frá Alþjóðagjaldeyrissjóðnum sem hluta af fjögurra ára hagsæld, inniheldur $ 17.5 milljarða að koma á stöðugleika fjárhagsstöðu í landinu. Hann bætti við að Úkraínska hagkerfið gæti vaxið árið 2016 ef ,,Rússneska árásargirni’’ væri stöðvuð og innri umbætur hafi tekist til. It’s the same why I chose this text because this is one of my interest and also my teacher recommended it to me. I have chosen a few articles but it was something that my teacher didn’t accept, so I got this. I was using snara.is for translation and asked people for help. I think it was easier to translate from English to Icelandic then from Icelandic to English. · What did you learn? Where did you learn? and for how long? · Why did you choose it to learn, not something else? · Where are you working now and how long? · How did you get to this work where you working now? · What are the pros and cons of the job? · What is hard and what is easy to work with and what the personal strengths you need to have? · Do you like to work there where you are working right now? · Is there anything more you would say about your job? · Is it easy to find work like this, if a person does not have any experience (just finished school, for example)? · Can foreign origin people work with this work (for example, those who moved here when they were little and learned here)? I took interview with one business and lawyer. His name is Birgir Orn Birgisson and he is 31 years old. Here is his dialogue. Birgir Orn finished three years of BS degree in business and laws at University in Bifröst. Then he took Master degree in laws at the University of Reykjavik, which took him two years. I studied laws therefore, it seemed to be both challenging and exciting occupation. So now he work as a lawyer in company which is called Greiðsluveitan and have been working there for 8 years. He have to control the all bills supposed to be paid in the right time. He said he get work easily, he saw in advertisement that in Greiðsluveitan they need people and asked for work, furthermore he get this job. He said the positive side of this job, it is good payed job and free work time. Then the negotive side of this job is how monotonous is it. You have to be well prepared for the work, determined and convincing to doing this job. There is nothing which is easy or difficult. That not easy to work with boring people. If bad for everyone if person is with out experience. Of course It’s good to have an experience that helps everybody, then is easier to get job. Of course people of foreign origin can work in this work, but they must be very good in icelandic. He said his opinion of this work, that is nothing special to working there. I chose this person, because he is one of the most interesting lawyer, enjoyable person and because I know him well. I met him first from bland.is he was looking for a female chihuahua dog for his chihuahua male dog, to let them acquire together puppies. So dogs was the reason we met. After that we stil had good contact. Of course when I met him, and get to know him better he told me that he was a lawyer, where he is working and everything about him. I didn’t forgot that. When teacher was talking about to take a interview with somebody, immediately in my head came only this person, I knew that im going to take interview with him. Of course I had more then one choises for example one of my cousin she is working now in bank and before learned management for 5 years. Then I know well people who is working in Mótus in Selfoss, because im also working there. So I had a lot of choises but I choosed Birgir Orn.